Who whore what? From Reese Witherspoon to Angelia Jolie, Emma Roberts to Allison Williams, Check all the 23rd annual Critics’ Choice Awards 2018 Blue Carpet Fashion Look. After celebrities rocked the Golden Globes red carpet in Black dress in solidarity with Time’s Up movement, Stars descended the blue carpet in pastel shades of color at the 23rd annual Critics’ Choice Awards 2018 on Thursday night in Santa Monica. Olivia Munn is hosting the show, at which a cast of celebrity presenters will announce film and TV critics’ picks for the best work of 2017. Angelina Jolie looked super chick in Ralph & Russo strapless off white gown with feather detailing, optima circle diamond stud earrings and finished off her look with dash of berry lip swatch. Gal Gadot appeared in shimmering Prada gown with a waist black belt at Critics’ Choice Awards 2018. The Wonder Woman actress was presented #SeeHer award by the movie’s director, Patty Jenkins. Jessica Chastain chose green color loosely pleated gown with a cut out detail in front and back. Susan Kelechi Watson arrived in Iris Serban designer sweet pink high slit shimmering single strappy gown and finished off her look with Le Silla sandals and Heliopolis clutch. 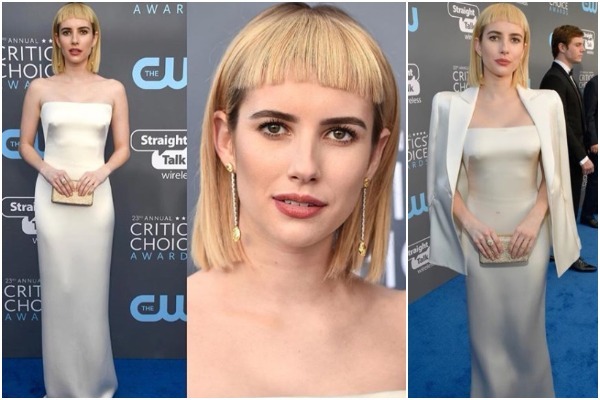 American Horror Story actress Emma Roberts new fringe haircut is what caught everyone’s attention. Emma looked gorgeous in strapless white satin gown and a satin coat, finished off her look with a long string earrings. Reese Witherspoon looked elegant in black polka dot Prada dress. Emilia Clarke wore polka dotted Dolce & Gabbana long dress at Critics’ Choice Awards 2018. Emilia and Resse were twinning in black polka dress. 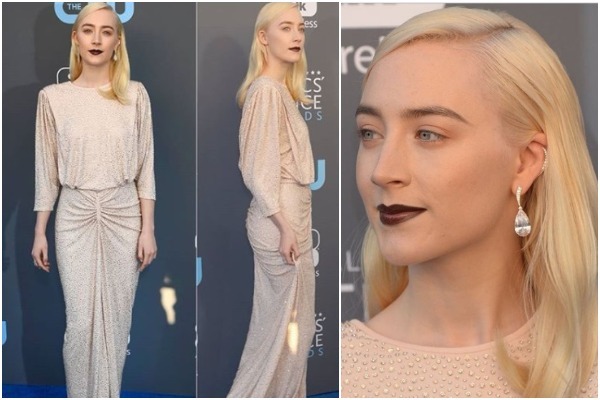 Saoirse Ronan looked so elegant in Michael Kors glittering neutral colored gown with a loose top half and a fitted skirt. Heidi Klum hit the Critics’ Choice Awards 2018 blue carpet in Goerges Hobeika’s high thigh slitted pale pink gown with a plunging neckline and Jimmy Choo sandals. Modern Family actress Sarah Hyland’s looked simple yet elegant in Naeem Khan’s black and white two layared tulle dress. She finished off her look with large diamond studs and red lip color. Jaimie Alexander donned Georges Chakra designed emerald shade green velvet hi-low gown with feather embellishments. Previous : Sonam Kapoor Shopping Wedding Jewellery With BF Anand Ahuja’s Mother, Marriage On Cards?